All-or-nothing thinking: Life is filled with complex grays and it is often destructive to break everything down to simplistic black and white evaluations. I think that it can feed a perverse judgmentalism. Overgeneralization: Hyperbole is a great thing when everyone understands that you are speaking in that kind of language. Sadly many times even we do not understand this and find ourselves covertly embracing some dark stereotypes. Jumping to conclusions: I am not sure why we do it but we rarely jump to positive conclusions. I think that we mostly do this when things agree with our preconceived ideas and understandings. Emotional reasoning: I am an emotional guy and as such have gotten myself in trouble when I let myself be consumed with the emotional side of life. I have to remind myself that my feelings do not always mesh with reality. 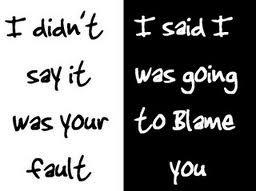 Blame: The Blame Game is one that is better to not be played. Many things that happen to us are not our fault or the fault of others. Blaming may make you feel good for a season but the bitterness that you develop is a high price for those feelings. If you are interested in learning more, I suggest you take a look at the whole list here. Can you relate to ever having these kinds of twisted thinking? Very similar to CBT...Cognitive Behavior Therapy by David Burns. I catch myself in these kinds of thoughts all too often. And the thing is...once the merry go round in your head starts spinning you don't even really want to try to stop the negative thoughts...stopping the negative thoughts seems almost ludicrous. I like the blog Beyond Blue. oh...it is the same list isn't it? And she mentions Burns in her post. I'll have to check out the other guy. I read a lot of the book by Burns...and if you google CBT there is a lot of info. I think a lot of the this negative thinking comes from seeing myself or my thinking as the standard by which I measure everything. I find when I get in this mindset, which unfortunately is too often, I need to get beyond myself and trust in God, or at least look at things from someone else's perspective.